On October 1, 2018 the Jagiellonian University celebrated the inauguration of the new academic year 2018/2019. During the ceremony at the Auditorium Maxiumum, Prof. Ryszard Markiewicz delivered a lecture entitled “Artificial intelligence and intellectual property”, presenting new challenges for intellectual property stemming from various aspects of artificial intelligence. Wolters Kluwer published the book “Management of the common copyright law”, authored by Dr. Michał Markiewicz. 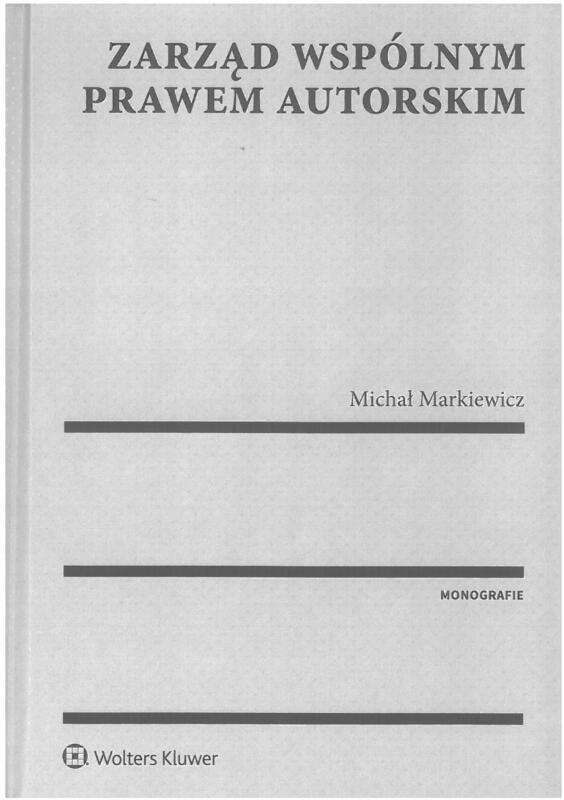 The book is a publication of Michał’s doctoral thesis. Congratulations! On June 21, 2018, Mr. Sroczyński participated in the gala dinner and roundtable discussion on the use of economic evidence in merger control and antitrust. The event was organized by Concurrences, White & Case and Compass Lexecon. Mr. Marek Niechciał, the President of the Office of Competition and Consumer Protection, was keynote speaker at this event. On June 20, 2018, the Centre of Antimonopoly and Regulatory Studies of the Faculty of Management at the University of Warsaw (CARS) organized a conference on “The Draft Directive on Unfair Commercial Practices in the Food Supply Chain and Polish Act on Counteracting the Unfair Use of Contractual Advantage”. Mr. Sroczyński was speaking in a panel on practical aspects of enforcement of the Law on Contractual Advantage, presenting the issue of qualification of farm animals as “agricultural or food products” in the meaning of this Law. Our law firm was one of the co-organizers of the conference. On June 18-19, 2018, a conference “Competition law – pursuing claims, protection of business secrets, relations with the OCCP”, was organized by MMC Polska in Warsaw. During the second day of the conference, Agnieszka Staszek was speaking on “The application of contemporary solutions in light of competition law”. Ms. Staszek presented key issues of competition law enforcement in the BIG DATA sector.